Quintana Roo's best amateur equestrians certainly brought their "A Circuit" game last weekend at the 20th Annual Merida International Invitational held at the beautiful facilities of the Club Hipico del Sureste (CHDS). March 2 - 4, 2012, jumpers from each of the state's finest equestrian clubs left nothing on the table in this exciting three-day meet that drew 110 riders from Mexico, the United States and Canada. Competition commenced on Friday evening, under the lights, with an exciting round known as only "The Joker". In this test of speed and agility, riders and their mounts are asked to navigate a circuit of jumps in the order of their choice. Each obstacle holds a different point value and the riders have one minute in which to clear as many jumps as they can. At the end of their course, the judges ask the rider if he/she would like to attempt "The Joker", a jump significantly higher than the rest of the field carrying a high point value. If the attempt is successful, these points are added to the score. If the rider drops a bar or the horse refuses, those points are stripped from their total. The team that clears the course with the highest number of points, within the allotted time, is the winner. 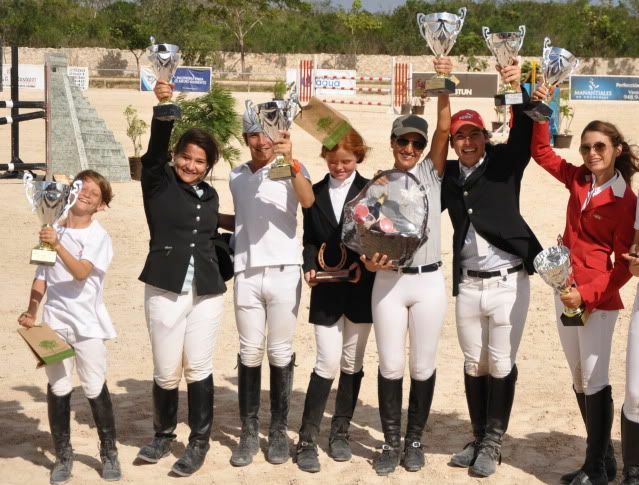 Equestrians from Quintana Roo handily took home first and second place in each of the three height categories! Saturday and Sunday riders of all ability levels, beginner to advanced, gave it their all over jumps from 40 cm. to 1.20 meters, thrilling the spectators and sponsors who have come to look forward to this event, year after year. The three-day event culminated in an emotional awards ceremony in which the top riders were presented with their trophies and other prized provided by the event sponsors Hamacas Azul Celeste, Productos Ecuestres del Sureste, Vinos Casa Mozarrello and EIKIShow.com among others. When the points were tallied for the three days of competition, equestrians from Quintana Roo were well represented in the circle of Champions. 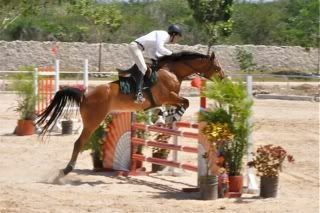 Cole Kinnon, riding for Hipico Playa del Carmen, earned the top position in 60 cm. 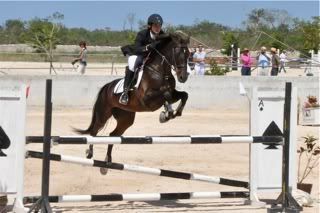 In 80 cm Iker Munoz Salas, riding for CYSE in Puerto Aventuras, took home the cup for 1st place with Jazmine Wedge of Hipico Los Corceles in Puerto Aventuras in 3rd place overall. 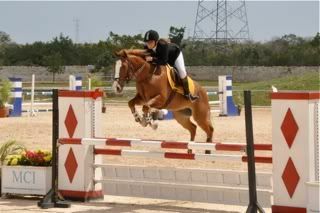 Mariana Graniel earned 2nd place in the category of 90 cm. riding for CYSA. Quintana Roo swept the 1 mt. category. Instituto Ecuestre Nacional's own Tanimara Macari triumphed taking home the Champion and Sub-Champion cups for her efforts with Jimmy Vazquez of Centro Ecuestre del Caribe Cancun bringing home 3rd place. In 1.10 mt., Mara Wills and Ivan Arcila came out on top for the weekend, taking home 1st and 2nd respectively, both representing Hipico Los Corceles. Congratulations to all the riders, trainers and horses who participated in this wonderful event and many thanks to our equestrian friends in Merida for welcoming us and continuing this great tradition. We look forward to next year!